Delicate perforation of the membranes and easy operation are essential for micromanipulation. With Prime Tech's knowledge and well established experience in microinjection, and their long-standing expertise in Piezo technology demonstrated in the very popular PMM-150FU, Prime Tech has created the new Piezo PMM4G. 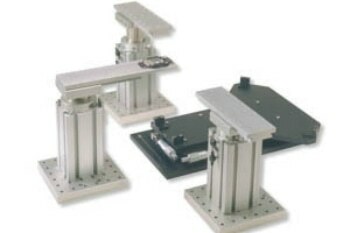 The improvements introduced in the Piezo PMM4G include; a smaller and more effective drive unit with improved transmission efficiency of force to pipette, 3 programmable modes: Standard, Piezo-ICSI and Expert to optimize manipulation for specific protocols, and an enhanced Piezo design that provides a more gentle and effective impact. The advanced user interface with a touch screen display provides ease of input and displays the current injection settings in a compact design that fits easily around the microscope. In addition, the new controller gives the user the ability to more precisely adjust the driving force. Prime Tech is very pleased to introduce the new Piezo PMM4G where the new designs, features and functions allow the user to attain a level of micromanipulation that is "Gentle for both Oocyte and Operator." The PMM4G is user friendly to both the beginner and the expert! The new MB-D drive unit easily mounts to the manipulator and has greater durability and performance. 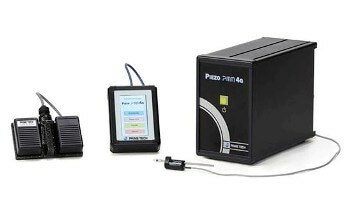 PMM4G enables the injection to be performed more gently through improvements to the drive unit. The PMM4G touch screen interface displays the various "mode" choices and settings. The Interface Module is compact so it can easily be situated next to the user. Settings can be selected or an on/off switch used to control the entire unit. The MPAS-CT4G controller includes a power saving function and has been reduced in size compared to the previous model PMAS-CT150. The new controller remians compatible with the PMM-150HJ/FU Operating Box [OP-15].